The gully that sliced the Owa Kurudu, Mayo Mayo and Logun communities in Ijebu-Ode, Ogun State, is akin to a smelly sore that festers by the second. Sadly, the erosion ravaging the communities for some years has swallowed houses which left their owners distraught. These distressed former house owners are even lucky. Others have died due to the intensity of the loss. Mr Pius Debo Awodemuren is one of the victims of the erosion. His wife, 74-year-old Mrs Awodemuren, amid visible pain, narrated how her husband struggled to build the house while using a tip of her Ankara to wipe her misty eyes. She stated that after they were finally able to build the house, they moved into it in 1989 when there was no gully or any life-threatening situation in the Owa-Kurudu area of Ijebu-Ode. The septuagenarian added that her husband bought the land in 1987 and it took him about two years to build the house. Awodemuren, who forced words out of her mouth as tears clogged them, said her late husband saved for years before he finally built the house. She said, “He retired as the principal of Ijebu-Ode Grammar School; it took about two years for us to build our house. When we moved in, there was no water at the back, it was just a bit low and the only time we saw water was when it rained. We walked over the place. It wasn’t even deep to be called a gutter but see what it has become now. “The problem started when all the water in Ijebu-ode was diverted to our side. The project started during the tenure of former Governor Olusegun Osoba when they started the channelisation of Ijebu-Ode water. The project stopped when it got to an area. Awodemuren added that when the problem was at infancy, her late husband and some other leaders in the community tried their best by writing to the Ogun State Government on the festering danger. “They visited the governor and even went as far as Abuja to the Ministry of Environment in order to avert any problem. But what they dreaded finally happened,” she stated. 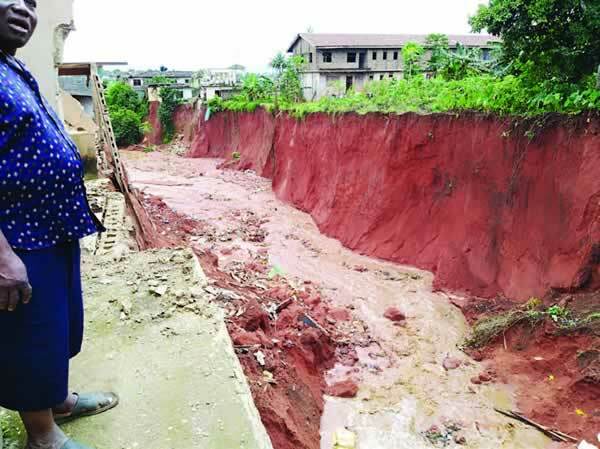 She told SUNDAY PUNCH that her late husband later developed hypertension the day erosion split their house into two and created a wide gully that destroyed everything. According to her, they were in the house one rainy evening when the house shook forcing the fence and soak away of the house to cave in. She added, “It was so serious that they had to cut our house into two. The day they did that was the beginning of our problem. The woman noted that he battled stroke for nine years because of the incident and suffered so much before her husband’s death while he was on wheelchair. Awodemuren said she had been living in fear of what might happen if nothing was done to tackle the situation since the death of her husband. The Ogunjirins, like the Awodemurens, who also live in constant fear, are battling a similar war. 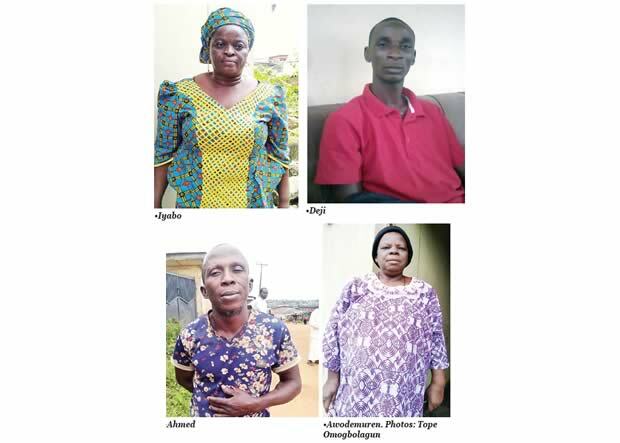 A retired nurse, the widow of Mr Sunday Ogunjirin, Mrs Iyabo Ogunjirin, was in pain as she recalled how her husband died of stoke after erosion destroyed their four-flat storey building. Ogunjirin, who stared forlornly at nothing in particular, said they were joyful the day they moved into the house because it was a dream fulfilled. “We saved and sacrificed for over two years to build the house. It was an eight flat apartment; four in front and four behind. We thought we had a place to rest after labour. “That was like the dividend of all our years of labour. But now, it is almost as if we are back to square one,” she stated. She told SUNDAY PUNCH how they toiled to put up the building which has painfully become a shanty. The widow added, “My husband was always onshore; sometimes he wouldn’t come home when he was supposed to. He did overtime to get more money to complete the house. Ogunjirin, who had become irritated from the pain of remembering all went through, accused the government of killing her husband. She said she was turned into a widow abruptly, adding that if the channelisation project had been completed, their house wouldn’t have collapsed and her husband would still be alive to enjoy the fruit of his labour. Ogunjirin started weeping as if she just received the news of her husband’s death. A welder, Baba Kukoyi, also died around the same time after his building collapsed and his family members vacated the premises. The first child of Kukoyi, Ahmed, told SUNDAY PUNCH that it was a difficult time for the family as they had to leave their house and look for another place of abode. Ahmed added, “The trouble of the erosion was what killed my father. He couldn’t bear the trauma having lost his only house. He laboured hard to build the house. We starved many days to build the house and when the house was completed and he thought he had rest from his labour, erosion claimed it. “My father and other community members saw that trouble was looming. They shouted but nothing was done despite all their efforts until the house started collapsing and the incident killed him. He noted that since their father’s death, they had been living in a rented apartment after the erosion rendered them homeless. Another landlord, Mr. Awosanya, popularly called Baba NEPA in the communities, also lost his life after erosion destroyed his house. His son, Deji, while speaking with our correspondent, lamented the calamity that befell the family 15 years ago, and ultimately washed away their father’s house. Deji said there was no canal or gully in the area when his father bought the land. He added, “We used to have a poultry farm where the gully is now. When the whole thing started, our fence and poultry farm were the first to cave in. Thereafter, many parts of the house were destroyed by the force of the water. “My father then decided to move out of the house before the building would fall off one day. But we didn’t know that he would never recover from the shock of the incident. “I was still young when we moved to the house. I remember vividly when we were building the house that my father left the welfare of the family to my mother because he was determined to build the house. Recalling that it took his father seven years to build the house, he noted that they had yet completed it when they moved in. “There was no window in the house then and we had to sacrifice so much to complete it. Despite all we went through, look at what has become of the house. My father was unhappy till he died because it was like all his labour was in vain,” Ahmed said. As the Awosanyas have yet got over their grief, Mrs Abike Ibipo-Odusanya (nee Onanaya), who is the daughter of the late Mr Onanaya, recalled the labour of her businessman father who struggled hard to put a roof over his head. Aside the loss of other lives in the communities, the erosion also destroyed property. SUNDAY PUNCH observed that most of the people living in the area are retirees. Parents ensure they keep vigilant eyes on their children to prevent them from straying into the gully. Our correspondent further discovered that the affected houses in the Mayo Mayo area had been abandoned as they could collapse anytime. Seventy-nine-year-old retired principal, Mr Oluwole Kujore, was one of those who lost their business to erosion. He said the erosion consumed his poultry business worth N5m. Pa Kujore added, “I bought the land in 1991 and we started the poultry business in 1996. I started the business in 1997 after I retired as the principal of Ijebu-Ode Grammar School. “There were no traces of water or anything there when I built the poultry. It is not possible for anyone to see water and decide to start a poultry business. “The problem started when the Ogun State Government started channelisation of water. The water from Igbeba and other places was channelled to our area instead of letting the water flow into the river; they directed it to our houses. Once it rains like this, water will flood my poultry and kill the chickens, turkeys and leave my pig and ducks flowing in water and the eggs wasted. Kujore is not the only one who lost property, the chairman of the Association of Landlords in the Owa Kurudu community, Mr Micheal Adegbesan, had his own share of loss. Adegbesan, who retired from a brewery, told SUNDAY PUNCH that he invested his entire gratuity in fishing. He said he invested over N3m in the business as a source of livelihood since he wasn’t entitled to any pension. He stated, “I was paid off from my company after my retirement. I decided to go into fish business. Little did I know that the government was going to destroy the business. There was no canal or gully there when I started the business. I wouldn’t have invested such huge amount of money if I had known. Adegbesan said he started the business to be able to live happily after his retirement but now live on charity from his children, friends and well wishers. Another resident, Mr Adesanwo Maseka, has another tales of woes as a result of the ever-expanding gully. He disclosed that he also lost his bakery and eight-room boys quarters to the erosion. Maseka, who said he was the first to move into the community in 1984, lamented that he lost everything within a twinkle of an eye. He said, “When I moved into the area, there was no canal or gutter. We usually crossed over there to buy things at the Mayo Mayo community and many people often came to buy bread from my bakery. “Trouble started when the government decided to do what they called channelisation of water. That, in itself, is not a bad idea but the danger of the whole thing was that they didn’t link it to the river. Obviously recalling that he had yet to recover from the loss, the septuagenarian broke into tears as he lamented the “wickedness” of the people at the top. Alhaji Tunde Agbomabiwon is another victim of the devastation of erosion in the communities. He told SUNDAY PUNCH that he had been living in the area for over 27 years and was about to lose his house to the erosion. He added that most of those affected were retirees who might die of heart attack due to the stress of coping with the loss. Mrs Awodemuren urged the government to quickly come to the aid of the embattled residents as they were living in fear every day. On her part, Ogunjirin pleaded with the state government to save them, adding that anytime it rained, her heart beat heavily because of fear of what might happen. According to Agbomabiwon, whenever it rains, the residents fall into the pit of gripping fear as the water pours in torrents. “For about two to three hours after it must have stopped raining, floodwater will still be pouring through. I am really scared that if the government does not do something on time, our houses will be destroyed and many people will die,” she added. Maseka said he was always on the lookout for the kids to avert danger. He added, “We thank God that no evil has befallen any child in the community but for how long, we cannot tell. We are always careful of the children, so they don’t go near the gully. You know children can be so curious and most times, they like to satisfy their curiosity. 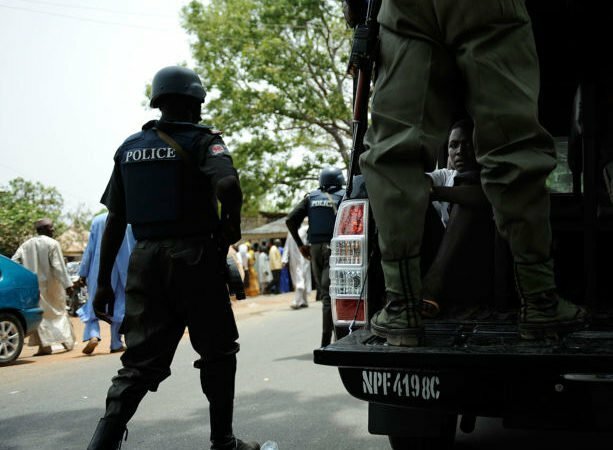 A landlady, popularly referred to as Mama Buka, told SUNDAY PUNCH that she was not around when the latest incident happened, saying immediately she got back, she had to send all her grandchildren living with her back to their parents to ensure their safety. Meanwhile, when SUNDAY PUNCH contacted the Commissioner for Environment in the state, Mr. Bolaji Oyeleye, he said the issue had been on for a while, adding that the case had been presented before the Federal Ministry of Environment. Oyeleye stated, “We are aware of the situation at Owa Kurudu and its environs and we have reached out to them. Personally, I have been there on two or three occasions. I took the National Council on Environment there last year. I was also there when we were doing the dredging of Owa River itself in Abeokuta. “The thing is that the magnitude of the erosion is beyond what the state government can handle. We have approached the Ecological Funds Office, the Federal Government and the National Council of Environment for help last year. The minister then promised that they would raise a memo to that and that is what we are following up. It is not something that we are not aware of and we are working on it. He noted that the channelisation was done by the Federal Government, explaining that it was never a state government’s project. He claimed that most of them were intervention projects by the Federal Government. Talking about a temporary solution to the dreadful erosion, the commissioner said the residents of the community should look for alternatives accommodation. Efforts to get the comments of the Minister of Environment, Mr. Ibrahim Jibril, proved abortive as the spokesperson for the ministry, one Mr. Sagir, said he could not make an official statement without talking to his principal. “I cannot say anything on the issue without talking to the minister and I have been trying to reach him but I can’t get across to him yet; same with the ecological fund boss. I was told they travelled together. Once I reach either of them, I will give you an official statement,” Sagir stated on Friday.